Packaging - Plastic wrapped with vibrant colors and graphics on front. Can open easily from end or from anywhere along the backside plastic crease. At First Glance - Bar is approximately 15 cm and covered evenly with brown milk chocolate. Has a bumpy texture on top and flat on the bottom. There is no strong tea aroma at this point. Up close you can only smell the milk chocolate. What's Inside - I cut the bar on a diagonal to get the largest cross-section possible. The center of the bar matches the picture on the wrapper. Once cut the strong tea aroma escapes from the middle of the bar. 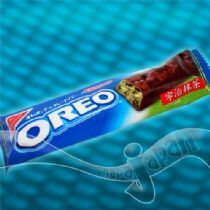 The outer chocolate is surprisingly thin and the oreo bits are large. The Taste - First I placed a small piece, containing all ingredients, on my tongue and let the chocolate melt away. The chocolate tasted very good with no other tastes present. As soon as I bit into the crunchy tea filling I was surprised by the strong flavor. It almost tasted like molasses at first but settled down to a Royal Milk Tea flavor (the type of tea drinks sold in Japan that are loaded with cream and sugar.) The large Oreo bits were delicious as always and the white Oreo icing added more sweetness. The consistency of this bar is crunchy yet flaky. I really like the density of it. There was no strong aftertaste once consumed. Extra Info - This is a limited edition flavor which will probably be in stock until early winter. Best before dates will extend into 2011 as new batches are produced. I enjoyed this rest of this bar with a glass of milk since coffee or tea would have probably taken away from the flavor. Happy Snacking! Please keep checking back for the latest Japanese Candy Releases.